The Merry Maiden's tough captain sets his sights on the love-smitten Willie Brisling's charming fiancée and kidnaps her. Now, she is a prisoner of love. Will the adulterous sea captain get away with cheating? Caught between a rock and a hard place, an honest man has to cover for his partner's shenanigans when an old flame threatens to destroy both his career and his marriage with a compromising photograph. Will she spare him? Neglected by her husband, our heroine decides to make him jealous by getting the handyman to play a literary genius at a party and flirt with her. Thrown in prison for a hundred years, Little Goofy and Big Goofy finally break free, posing as an anarchic duo of undercover painters. Soon, the boys wind up in a private party as visiting French dignitaries; however, who are they kidding? The boys are contracted to build a house in one day. Upon completion, a bird lands on the chimney and the house collapses, bit by bit. When the owner demands his money back, mayhem ensues. To flee from a tireless Forest Ranger, the shabby vagrants, Stan and Ollie, find refuge at a colonel's mansion that is vacant for the weekend. Soon, a couple of newly-weds arrive in hopes of renting the manor. Where is the rightful owner? The novice repo men, Stan and Ollie, are sent to serve a summons to a tough customer who hasn't paid for a radio, as canines, a rifle, and a steamroller threaten to put an end to their ambitions. Just how hard is it to get the job done? Willie Brisling: The wretch! He told me he was practically single! Considering that this was BEFORE Laurel and Hardy became a team, it's pretty good. Stan Laurel and Oliver Hardy were both under contract with Hal Roach Studios in the late 1920s. However, they were not a team but separate acts who just happened to appear in some movies together before Roach realized they would make a good team. Because of this, most of the films they made in 1927 didn't have the same chemistry as later films and they often worked against each other in the films--being enemies such as in SAILORS BEWARE, FROM SOUP TO NUTS and this film. While these were pretty good films, they really don't seem at all like Laurel and Hardy films. 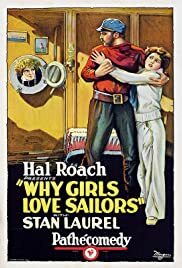 In WHY GIRLS LOVE SAILORS, Stanley's girlfriend is kidnapped and taken aboard a very rough boat filled with some tough characters--one of the meanest of which is first mate, Oliver Hardy. Ollie looks very different in this film--without the trademark mustache and sporting a very stubbly face. Plus, it's one of the few films from 1927 on where he was a real villain--something he did regularly in his earlier films. Since Stanley can't possibly overpower the entire crew, he uses his wits (and a dress) to outsmart them--leading to an eventual "boss battle" with the captain at the end of the film. This film excels due to good writing, some clever gags and because it's so gosh-darn different. Fans of the team are encouraged to find this one and see a truly unusual Laurel and Hardy film.